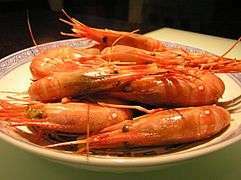 White boiled shrimp is a variety of night dish in Cantonese cuisine. The dish is made with shrimp in boiling (灼) hot water, and served with the shells. The shrimp is then eaten with soy sauce. When finished, people wash their hands in a bowl of warm tea and lemon. ↑ Big5.xinhuanet.com. "Big5.xinhuanet.com." 廣東菜係. Retrieved on 2009-08-15. 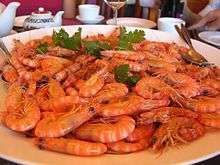 ↑ "鯉漁門海鮮餐 Seafood in Lee Yue Mun Pass". wordpress.com. 2012-02-18. Retrieved 13 August 2012. This article is issued from Wikipedia - version of the 1/3/2014. The text is available under the Creative Commons Attribution/Share Alike but additional terms may apply for the media files.